Does the word “Edgerank” make you break out in a cold sweat? Do you want to punch Mark Zuckerberg in the groin every time your Facebook post is only seen by a fraction of your audience? And do you have an extra 20 bucks or so? If your answers are yes, yes and yes, you’re a perfect candidate for Facebook’s new Promoted Posts feature. Because of that evil Edgerank algorithm, a brand’s Facebook posts are only ever seen by a small chunk of its total audience. Promoted Posts bumps up that number, showing your update to a much larger chunk of your fans – for a price. Yes, they’re technically ads. But Facebook has blurred the lines between what’s paid for and what’s organic so much that all social media marketers need to pay attention, whether you run ad campaigns or not. Here’s how Promoted Posts work, how they can be used and what to expect from them. Who can use Promoted Posts? If you have a brand page with anywhere from 400 to 100,000 fans, you’re eligible to participate in Promoted Posts. Oh, and a budget. You’ll need to have that, too. If you’re cleared to use them, you’ll see a “Promote” button on the lower right as you’re preparing your post. What kind of content can be promoted? Any kind of update you can regularly post to Facebook – including status updates, photos, videos and questions – can be a Promoted Post. Your post can be promoted when you create it, or you can choose to promote past posts that are less than 3 days old. The promotion period only lasts 3 days, though, so be careful the timeline works in your favor as you choose your post. What kind of content should be promoted? Facebook recommends brands use Promoted Posts for things like offers, events and news, questions, photos and videos. From a pragmatic point of view, only the first two of these really makes financial sense. Photos and videos are generally the most likely to be engaged with kinds of content on Facebook, so chances are good it’s not necessary to pay for further views there. Questions are a staple of engagement-focused social media and while it’s nice to get lots of fans involved with them, it’s usually not crucial. It makes the most sense to focus on sharing links (normally the toughest to get engagement with) to brand-relevant announcements and offers. Basically, the stuff you really want a majority of your fans to see that isn’t the sexiest or most viral and therefore might need a boost. How will people see the post? Promoted Posts do NOT show up in the real-time ticker (slight con) but whenever one of your fans likes, comments or shares the content, all of that person’s friends will see the Promoted Post, too (big pro). 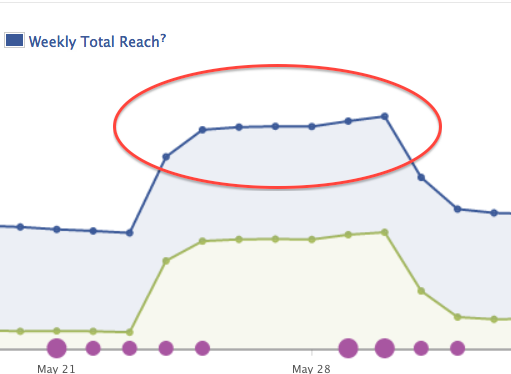 What does this mean for your Facebook strategy? Promoted Posts are a new opportunity for reach, but definitely not a substitute for real, hard-fought engagement. Brands striving for higher Edgerank and more fan participation through solid strategy and creativity have no reason to change gears – nothing is different about how posts are currently shared organically and virally. But now there’s an ace in the hole when it comes to the content you really need to get more eyeballs on. Promoted Posts makes sure fans who have crowded newsfeeds or maybe weren’t on Facebook the day you posted get to see your update. The nice thing about the dawn of Promoted Posts is that they’ve led to more analytics for social media marketers to use in understanding and optimizing for Edgerank – even if you’re not spending any money! For all new posts (and going as far back as the beginning of May), Facebook offers the new statistics of people reached and percentage of fan base. Hover over the numbers to see a breakout of how you reached your fans (sources include organic, viral and paid) and a visual representation of how many of your fans saw the post. 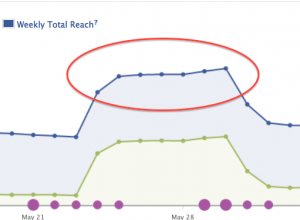 If you’re not using Promoted Posts, you’ll only see organic and viral traffic – still handy! If you have promoted a post, you can drill down even further by clicking on the “promote” or “promotion complete” tab to see how many actions were taken as a result of your promotion. What if it’s not in the budget? Unless you’ve already got a huge number of fans, the dollar amount to try out a Promoted Post should be pretty minimal. It’s probably worth $10-$20 to give it a test run and analyze the results. But if you’ve truly got no budget, don’t give up hope – just because you can buy it doesn’t mean you still can’t earn it. Sometimes you can get important posts in front of nearly as many fans with a viral content workaround. Make sure you know about important announcements or offers well in advance. Then look for some irresistible, gotta-share-this pieces of content to promote a few days before you need to publish your important post. If your awesome content has done its job, you should have a nice Edgerank spike that’ll serve to push up your reach for a cushion of a few days, thus getting your content out to more of your fans. Have you experimented with Facebook Promoted Posts? What tips do you have? Let me know in the comments. ← We Can All Be Superheroes!